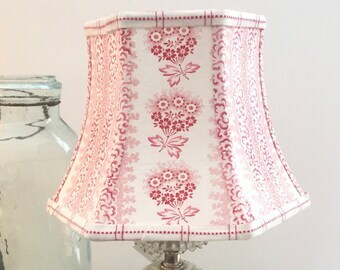 French Fabric Lampshade, Rectangle inverted cut corner lampshade in pretty vintage fabric - Great shape! 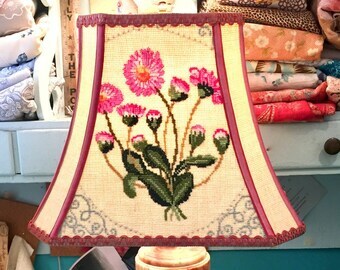 English Daisy Lampshade handmade with vintage needlepoint, pink and green floral lamp shade - Think spring! 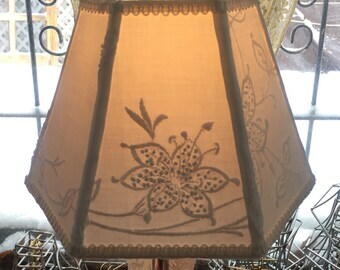 My Etsy Lampshadelady shop specializes in lampshades handmade with beautiful vintage textiles from around the world. 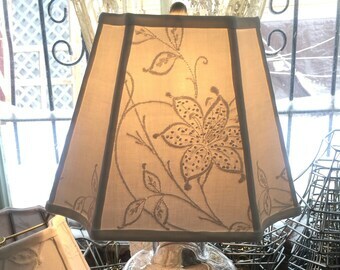 I am offering FREE Shipping if you purchase 2 or more lampshades. 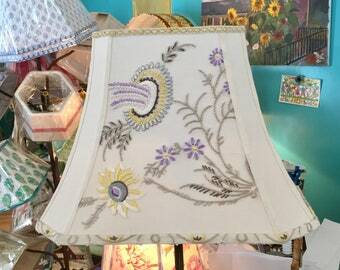 I incorporate vintage French fabrics, vintage embroideries, needlepoint and crewel into my lampshades. Custom lamp shades are also a must in my business. Light up your room! 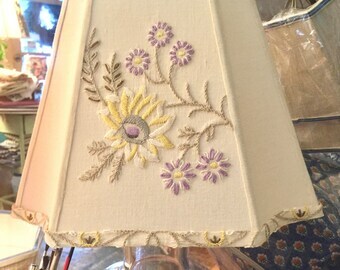 Floral Lampshade, Vintage Embroidery desk lampshade, Magenta and Green Thistle - Lampshadelady Loves! 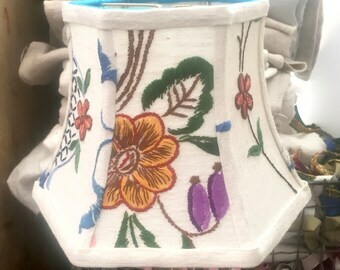 Blue and White Lampshade Handmade with India Block Print Fabric - Fresh look! 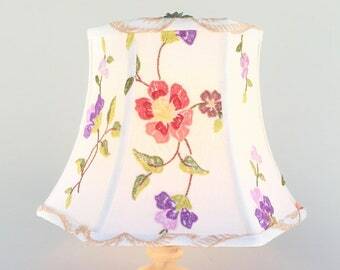 Floral Embroidery Lamp Shade, Hex Bell Lampshade, Good size for swing arm lamp or desk lamp - One left! Clip on shades in vintage linen. Fresh! Nice print for bridge lamp. Oooh one of the prettiest! Buy a pair and get free shipping. Outside my shop. Gardening is a good break! I love having my own business. I continue to grow as an artist challenging myself to become a better designer. My grandmother said that I always had a a pair of scissors in my hands! 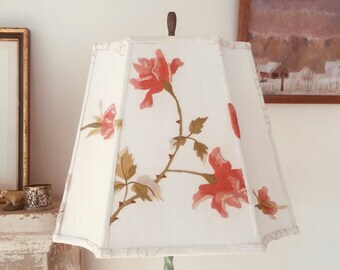 All lampshades are handmade and designed by me! No outsourcing or light manufacturing, thank goodness! I studied studio art in college. I was a tapestry weaver. I spun yarn, knit, paper making, batik, lots of collage....anything with fiber. Finding my path after college was a little harder. I dabbled with my weaving and yarns, but never felt there was a business there. 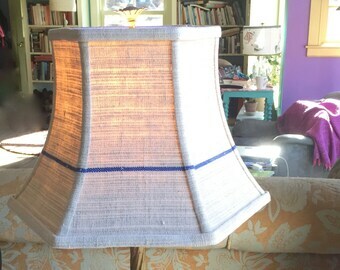 I taught myself to make lampshades at age 26... now... almost 30 years later! I started as a hobby and need for lampshades for our first house. All my friends and family got lampshades! And then the tipping point came and it hit me---maybe this might be a fun business! And ooooh, the hard lessons learned, the marketing lessons in the days way before the internet, the early craft shows- good and bad and terrible! The design evolution in the past 30 years! I love challenging myself to do better- to go beyond good--- to reach the BEST product I can make. I like to say, LAMPSHADE MAKING is a craft but I take it to an ART! I started on Etsy Dec. 2012. I'd came to Etsy before my book came out in 2008, but was really too busy to attend to it properly. Before I came to etsy I shopped on it for a year and watched my product category for a year and in the end decided it was the perfect place for my product. There is MUCH more to selling on Etsy than meets the eye. It's been a fun challenge to try to figure it all out! 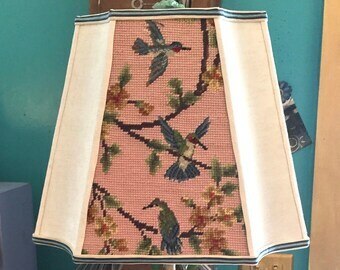 I have been making handcrafted custom decorative lampshades since 1985! I have chosen to keep my shop small. I can change my styles on a dime. I like to have unusual work that isn't like the run of the mill big catalog home design. One of a kind; OOAK is my specialty. I pride myself on my work. It comes from the heart. I do ALL my work by myself. I love to find all my fabrics, embroideries and wonderful fabrics and lamps. It's a wonderful business and so happy I have fallen into this life! ps if you come to Vermont, stop by and say HI! One of the lampshade ladies. I have been making lampshade shades since 1985. 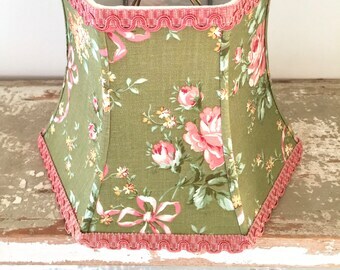 I specialize in small to medium lampshades using vintage fabrics, decorative textiles and vintage postcards. Molly is a big help keeping children busy while their mom's shop! Welcome to my Esty store. 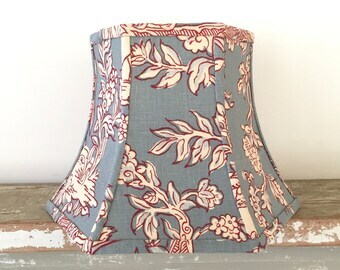 I search the world for the most interesting textiles to make my handmade lampshades. 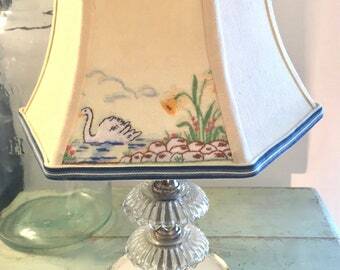 I love vintage embroidery, crewel, needlepoint and especially vintage French Fabrics for my lamp shadres! Custom orders always.